I'd like to sign a petition to grandfather the challenge cache. No, you got me wrong. If you log the HQ geocache, for example, it will show up as a sub-category of your mystery geocaches. Or the event category has three sub-categories split into regular events, CITOs, and MEGAs. They could make them a separate category under way marking and move them over there. They are just a Mystery cache nothing special and many of them are utterly ridiculous. OK, that literally made me laugh out loud at my desk. I'm just in favor of removing them like we did with all the other ALRs. Even if some challenges are crazy or what you may call impossible or tedious, if you read the logs of some of the good challenge caches, you will see really long log entries detailing their experience, enjoying places they might not have visited. Challenge caches can have really high favorite points too. If you do not like them, fine, but others do. Personally I like the idea of their own icon, just do not think it will ever happen for a number of reasons, the biggest one being Jeremy does not want it, at least last I heard. Second, it would be a long process to fix all the old ones. Third, you'd have to write out clear definitions of what challenge caches are (minimum # of caches, differentiate vs series) so you know which was a puzzle and which was a challenge. You can't just identify by the title or even the word inclusion of the word "challenge". I'd love to help assist it happening in any way, but just do not think it will happen. If it could just happen like that tomorrow and all the roadblocks done, I'd love to see it happen. I haven't heard Jeremy saying that he doesn't want them to have their own sub-category or icon; these are just rumors. And I wish Groundspeak would consider a public poll on that to simply ask the community what they want or don't want. My personal perception is that mainly "old geocachers" are against all kinds of innovation in general, not only in this thread (cf. Lab Geocaches or Souvenirs for example). For me, geocaching is "young," "innovative," and yes, it started to change a lot by the development of smartphones and the GC app. That's both a simple and irreversible fact, so we all have to look forward and move on with it to "Geocaching 2.0:" I used to dislike Challenge Geocaches until I discovered that they have more potential for creativity than just "Find 100 Letterboxes" or so. And I was surprised to see at my Maker Madness Challenge Geocaches theme event last Sunday how many new Challenge Geocaches are already in preparation by the attendees of the event: roughly 40 new ones just for northern Germany. That's amazing and shows that they're becoming more and more popular (at least here). Creating an own category and icon would be the logical consequence if this turns out to be a general tendency within the community. To me, a separate icon makes sense as there are special rules for these kind of caches. If it is distinct enough of a type to have its own rules it should have its own icon. Cachen? - am liebsten Nachts! 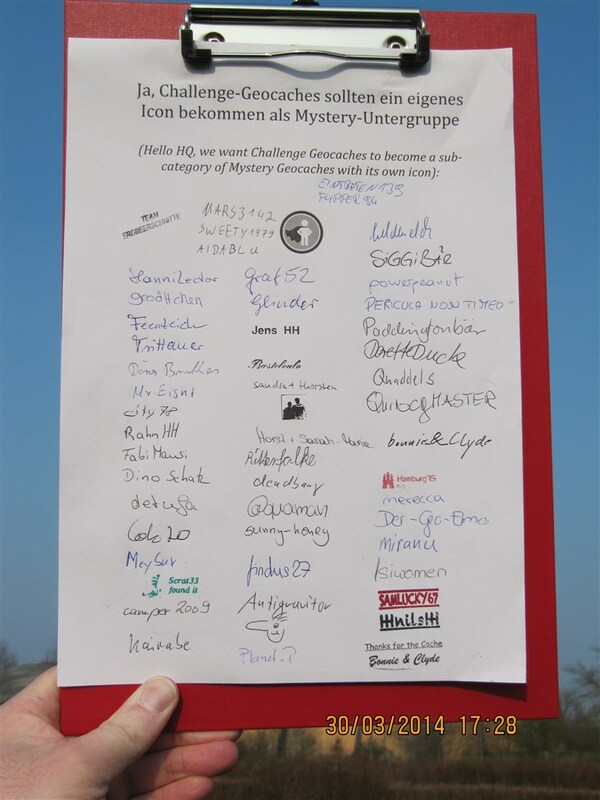 I also like Challenge Caches very much (and so do a lot of geocaching friends of mine)! I would love to see them with their own icon. Why not use the "old" challenge icon for that? And further more would it be very easy for Groundspeak to identify them (from the normal mysteries), because they have to have the word 'challenge' in the cache name. Why wouldn't an attribute be enough? It just seems to me that people are looking to collect another icon. I discovered that they have more potential for creativity than just "Find 100 Letterboxes" or so. How so? Everyone I've seen is a numbers/grid-filling game. A (mandatory) attribute would help. It is not as helpful as an icon, as an icon can seen from the map. (I do much of my cache choosing via the map). - another one of my own challenges requires at have found at least one geocache in Spain - quite an easy task. But the coordinates of the final are hidden in a hand-written Spanish text which makes it harder to use Google Translator but you have to use your own language skills (or the help of a waiter at your favorite tapas bar) instead to find the final! The Earth Age challenge is an interesting one, but it's unlikely it would be approved (generally speaking, there can always be exceptions depending on the reviewer) - mainly because there's no earthcache property that can very the challenge requirements. The other ideas are all based on hard data associated with qualifying statistics and/or caches. Which goes towards the point about challenges being "a numbers/grid-filling game". Well of course, because the qualifications have to be verifiable, which means any statistic that can be utilized in some form of grid or graph or mapping or what have you. Hmmm, hadn't considered the map. Yes, I see how that could be helpful. My biggest concern, which Toz addressed, is that there would be a dramatic increase in them because people love icons and will create Challenge caches just to give and get the icon. Challenge caches exclude a lot of people and encourage folks to cache for numbers. Individual caches are not savored, they become kernels in the statistics popcorn bowl. All caches start to become like a power trail experience. Cache owners plant with challenge cache criteria in mind - e.g. a power trail of 26 caches planted along a trail to help folks trying to get every letter of the alphabet. As the game progresses numbers dominate more and more. I don't see the numbers aspect as an enrichment of the game. is that there would be a dramatic increase in them because people love icons and will create Challenge caches just to give and get the icon. I worry about this but, but not much. All it takes to own/get a Letter Box Hybrid icon is a stamp, yet few people create them. Just an observation. I think the primary bar is the programming cost, such that all units/phones handle a new type, built in to the search functions etc. I support a required attribute. And those that do, do it for the icon. They have generally no idea or don't care why the stamp even matters. Most use a dollar store stamp or grab something free from the kids' toybox. I have seen very few stamps in LBHs that have even a remote relation to the theme or the location. They just throw one in because they have to, in order to get the LBH icon in their cache hides list. It's really just a puzzle cache but the puzzle icon isn't all that unique. If they could omit the stamp and still get the icon I'm sure 99% would. The LBH cache-type is another type I would like to see grandfathered. It should be listed under the Unknown cache-type with a stamp attribute. I guess it depends a lot how one defines creativity. Most of your examples are not that special and exist in many places. Most challenge caches I know favour those who can invest a lot of time and money into geocaching. I do not need to give it a try to know that most challenge caches do not appeal to me (apart from the fact that many have a high terrain rating or require the visit of high terrain caches which excludes me anyhow). If others enjoy challenge caches, that's ok for me. I do not enjoy them except some exceptions which are however too far from my home location. To me geocaching neither is a game nor the United Nations. What I notice however is that challenge caches often bring along bad logging habits such as logging caches as found without a container being there and cheating with puzzle caches etc just to be eligible for a specific challenge. Also as a cache owner, I do not like to own a cache which happens to be one of few in the area that can be used for a certain challenge. Have heard this from his own mouth, but as I said, folks can change their minds over time. He once liked "challenges" too. Cezanne, you've hit the nail on the head. All the points you make are what I don't like about challenge caches. And as a cache owner I too do not like to own a cache which happens to be one of a few in the area that can be used for a certain challenge. I archived a bunch because it dawned on me that the reason most people liked them was not as I intended, but rather to collect icons to meet challenges. I would love to have the option to have our caches opted out of the challenge side game. Put me in the "not too worried" group. Of course, there will be a few people who collect cache owner icons, but that probably would be the case for any new icon that might appear in the future. Does that mean no new icons ever should be developed? Of course not. It simply means the benefits of any new icon should outweigh the harms. In the case of letterbox-hybrids, yes, there are plenty of mediocre ones out there (just like any other type of cache). But there also are many excellent ones that provide geocachers with a different kind of cache than merely looking for a traditional box under a pile of rocks at Ground Zero. The worst of the LBHs are just another traditional cache for me, but the different category also allows for a very different and enjoyable geocaching experience. And that's a good thing, in my book. Similarly, I enjoy the many new experiences that good challenge caches provide. That said, however, I'm not convinced a new icon provides much advantages over a new attribute, other than its mandatory nature. The full-featured map is helpful, but I'd probably be satisfied with running Pocket Queries on a new challenge attribute and using them to generate any maps I needed. Challenge caches exclude a lot of people and encourage folks to cache for numbers. SCUBA caches, boat caches, mountain-top caches, and tricky puzzle caches also exclude lots of people, but I'm glad they all exist, even if I'll never find some of them. Fortunately, I don't have to find every geocache that's out there. Profile statistics pages encourage some folks to cache for numbers, and Pocket Queries make it easier to get bigger numbers. Certain people enjoy that aspect of geocaching, while others don't. I don't see the numbers aspect as an enrichment of the game. I don't see souvenirs as an enrichment to the game, but some people do. I recognize that this activity appeals to a diverse audience. Those who don't enjoy caching for numbers don't have to do so. Those who aren't into SCUBA caches can skip them. Those who don't enjoy challenge caches can ignore them. It's really not that hard. But if I can get at them then I can put them on my found list. I don't have to record them as a note. I like keeping an accurate record of my finds on the GC site as well as the ability to exclude my finds from my searches. Attribute. Not sure why a Challenge Cache attribute hasn't been added - it seems the most appropriate change to address the situation. The Mystery type just means that there's some other aspect of the cache that is not covered by existing types. Whether that means the cache is offset from the posted coordinates for whatever reason (not covered by multi), or some grandfathered ALR is in place, or some other requirement must be met before logging it found. Challenges and Liar caches and Field Puzzle caches all have the cache at the posted coords but require some additional action before one can log it found online. Challenge caches are common, but so are puzzle caches. Puzzle caches are clear in the description. Field puzzles have an attribute. Why can't challenge caches have an attribute? We see new attributes being added fairly regularly. I was quite pleased to see a Tree Climb attribute added recently (a suggestion I put forth and supported years ago, likely with many others). Can't wait to see a Challenge Cache (or "Qualification Required"?) attribute. Then if you don't like'em, you can easily search and ignore'em. Like most any other property or aspect of geocaching. Every aspect of geocaching is exclusive to some segment of the player-base. That's no good reason to ban or deny it outright. It's a judgement call the Groundspeak has to make based on community feedback. Challenge caches are here to stay. Let's see an attribute please. Those who don't enjoy caching for numbers don't have to do so. But we get forced into the numbers game even though we don't want to. COs don't have the option not to have their cache used for a challenge. If by different geocaching experience you mean directional clues, that's already covered by the Unknown cache type. If you provide directional clues and no stamp, it's an Unknown cache. Yet some cache owners don't want the ordinary Unknown cache type icon. They throw the unrelated free stamp in there just to get the icon. Groundspeak has already provided the different enjoyable geocaching experience when they created the Unknown type. No need for an LBH type or a Challenge type. The only valid reason I see is the map and I don't think it outweighs the many negative realities. Glad to see more agreement on the attribute suggestion. COs also don't have the option not to have their caches found by families with kids, geocachers with dogs, mobile-phone geocachers, or bald geocachers. Geocaching accommodates a wide variety of geocachers. I'm not sure why that's a problem. If by different geocaching experience you mean directional clues, that's already covered by the Unknown cache type. If you provide directional clues and no stamp, it's an Unknown cache. Yet some cache owners don't want the ordinary Unknown cache type icon. They throw the unrelated free stamp in there just to get the icon. Groundspeak has already provided the different enjoyable geocaching experience when they created the Unknown type. No need for an LBH type or a Challenge type. Yes, some cache owners simply throw in a stamp and call it a letterbox-hybrid. Just like some cache owners simply put a magnetic keyholder on a guardrail and call it a traditional. There are mediocre caches to be found in every category. While the Unknown cache type certainly allows for directional clues, having a separate icon for LBHs actually encourages many cache owners to reproduce fuller letterboxing caches, including directional clues and hand-carved stamps. If LBHs were grandfathered, I'm guessing there would be many fewer of these different kinds of geocaching experiences. And the activity would be staler as a result. So, you're not opposed to challenge caches because they exclude lots of people but rather because they don't meet your semantic definition of a "find." We also could exclude EarthCaches, GPS Adventure Mazes, and events, since none of those really involve finding caches either. But geocaching is a more interesting activity because of them. Diversity isn't necessarily a bad thing. As for having the ability to exclude caches from your searches, you can use your "Ignore List." My experience is that most cache owners simply throw in any old stamp and call it an LBH. That's been the frustrating part for me - there are very few LBHs that include directional clues AND hand-carved stamps or even relevant stamps. In the last couple of years I don't know of one that has both. None have hand-carved stamps, and those that provide directional clues have a non-relevant commercial dollar store stamp thrown in "for the letterboxers". Some throw in a hole-punch instead of a stamp. I use to run a LBH PQ weekly but it was a lesson in frustration. Maybe things are different in your neck of the woods. If people truly enjoy creating hand-carved letterbox stamps and visiting hand-carved letterboxes they would still do it even if the only icon they get is the Unknown icon. A stamp attribute would be useful but in particular, 2 stamp attributes - one for hand-carved stamp, one for commercial. My ignore list is huge, I ignore a lot of caches. If I could divide my ignore list into sub ignore lists I would use your suggestion. I would put caches I've found but can't log (guess that would only be challenge caches) into that list. It could work as a pseudo-found list. How about something like this for an attribute? I can only drive one car at a time. Why would I have to worry about how many cars? Unless this is some "team challenge" where you send 3-4 cars full of people out, log them all as "the team" and then everybody can claim the Challenge Cache as found, even though they may have only individually found a cache in 3-4 of the federal states in the 24 hour period. You think so, eh? I wouldn't be so sure about that. Considering the reviewers were getting so fed up with them that TPTB changed the guidelines for them a couple years ago. I'm not one, so I don't know how much of a world wide consensus there was among them or anything. It's certainly not like there was an outcry from the regular players for those changes. You know, like "Dear Groundspeak Customer Service: This challenge cache published in my area is going to alter my normal caching habits. Sincerely, Geocacher". Personally, I think they're skating along on thin ice. Or at the very least, even stricter guidelines being slapped on them, with possibly archival of Grandfathered ones that would no longer be published today. Just my opinion, but I thought I'd throw it out there, since it seems to be the opposite of yours. From the couple of dozen letterboxes I've found, I don't see much difference from the LBH's you mention. Almost all of them had a commercial stamp in them, and rarely fit any "theme" of the letterbox. I don't see why cachers need to hold to a old-school line (hand carved stamps) that many LB's don't. That's like saying only caches hidden with a B&W, no maps GPSr are "real" caches, because that's what geocaching started out with. Not sure I like being quoted from an old thread. I may have changed my mind. I shudder at the long glowing logs and favorite points that some challenges get. Maybe I'm an elitist, but I like to think that I enjoy caches that the majority of geocachers have no interest in. I particularly like long hikes with only a few caches to find along the way. We have a couple of challenges here that were presumably put out by like-minded geocachers as a way to get people to take more hikes and enjoy our local mountains. Frankly, I'm a bit annoyed that numbers cachers who are more likely to be out on a power-trail are now competing to complete these challenges. Instead of taking many long hikes, they arrange group hikes with car shuttles to let them cover more ground and find all the required caches in fewer than a dozen weekends. What's more is that there are now caches on this trail every .1 miles (where caches can be placed), including in remote sections where you used to have to hike all day for one cache. And while there used to be mix of regular and small caches with different styles, now 90% of the caches are pill bottles under a pile of rocks. Sure the finders of the challenge write long found logs about how much fun they had on the trail. Compared to the powertrails and urban parking lots these cachers are used to finding, hiking and getting out in nature is going to be a lot more interesting. And I don't begrudge that some of them may even be surprised that they were actually able to put out the physical effort of these hikes. In the old days, I would have written a long log and almost certainly given a favorite point to that lone cache I took all day to hike to. Now, I'm not sure which cache is the original hide. In all likelihood what I'm finding is a throw-down replacement left by one of the cachers who passed here for the challenge cache. In fact the rules for this challenge tend to encourage people to leave throw-downs so they won't have to come back. Pity the poor traditional hider who doesn't want to allow throw-downs; he would be ripped apart in the local forums for interfering with people being able to have the "fun" of completing the challenge. So it may be that others like challenges and that challenges encourage people to try caches they might not otherwise try, but some challenges also have an effect on the people who might prefer a slower paced game. I suspect that so long as challenges have enough restrictions and reviewers are willing to enforce them, we won't have people creating silly challenges just to get an icon. The challenge I referred to above would likely not be published under the current guidelines (though I'm not sure because I've seen others get published that are a bit less difficult to complete but which have similar problems). As it stands now both people who like challenges but don't like puzzles, and people who like puzzle but don't like challenges suffer from them being lumped together. Of course there will always be the other caches that are listed as Unknown, just because this this the catchall for things that aren't traditional or traditional/multi. I'm not sure if the challenges should get the icon or if puzzles (meaning the cache is not at the coordinates) should get the icon. And there is a question of what to do with challenges that are not at the posted coordinates (because there is a puzzle in addition to the challenge, or because it's a grandfathered Delorme challenge where you have to email the owner for the coordinates). Which is your opinion? Your prediction of the fate of challenge caches, or your feeling about them? I don't necessarily disagree with your prediction. But their fate is most definitely a judgement call that Groundspeak has to make... so, how things change in the future would entirely depend on 1) where GS wants to take them, and 2) how much backlash there is from the community about them. I don't think they'll be gone any time soon because I see pockets of communities that adore them, and pockets that abhore them. There's no clear majority (though I'd wager the vast majority are either supportive or apathetic about them). At least, they are a far cry from what happened with Geocaching Challenges Challenges Caches were around earlier, and have been around much longer since.. I think think they're here to stay, unless Groundspeak gets rid of all ALR-style caches, which is unlikely, imo. Just to mention my main points again: A new icon (recycle the old one for it!) and a sub-category under puzzle geocaches both make sense since Challenge Geocaches have their own rules in the guidelines while other kinds of puzzle geocaches don't. That's why an attribut is just not enough. Moreover, the argument for a quicker selection on the interactive map is another important aspect. And it works both ways: Those of you who want to ignore Challenge Geocaches could then identify them much quicker as well as also those of us who like Challenge Geocaches and are actively looking for them on the map. Right now, you have to read at least the title or name of each mystery geocache (but I've seen that the adding of the suffix "[Challenge]" doesn't work corectly in all cases) in order to find out what each individual geocache is about. Thanks to everyone for this great and vivid discussion that was triggered! I explicitly include the negative criticism into my appreciation,too. It's always fruitful to exchange different opinions. Groundspeak abolished this type of feature which has been present for a while (e.g. for new country souvenirs) because they did not want to create the impression that a high number of supporters increases the chances of a request to be implemented. I'm pretty sure that GS is not willing to create a new type for challenge caches. Actually right now I'm not expecting them to add any new cache type to the normal system as they started to play with the separate lab platform. Of course this is only my speculation. GS doesn't allow polls in the forums so you might consider this thread and others like it as an informal poll. As I see it, opinions have ranged from "Challenges are great. Let's have a new icon for them" to "Challenges should be grandfathered". I didn't assign a Pro/Con value to each post but I'm just not seeing a strong consensus on your proposal. Given that GS has a finite amount of development resources, I would prefer to see them applied to some of the many feature requests have a much stronger mandate. I also don't buy the "if you don't like them, just ignore them" argument. Even if one chooses not to do challenges they are still having an impact on how the game is played in many areas. If if someone never does a power trail, it's hard to deny that power trail mentality has impacted the game as a whole, and in my opinion, not for the better. Thanks for this reply but I was rather thinking of a general poll that reaches all, for example when you log in, you have to cast a vote (then, or later on after having made up your mind, or with the option not to take part in it, too) which is internally combined with your profile that makes sure that you can't cast a second one. The invention of a new icon is too seldom and too important just to ask those who are active here (which I assume to be a rather small fraction of all users). Technically, all this is no deal; that's why I can't go along with your "limited ressources" argument: I bet that the invention of a whole new platform for GC Labs (which is great) took/takes way more capacities. But by simply allowing something like challenges as puzzle geocaches in the past and giving them their own rules, Groundspeak itself paved the way to the second stage which is from my personal point of view to separate them from regular mysteries and promote them by inventing a new icon. I know that polls have been abolished some time ago but wouldn't it be really interesting to see what the results were if you ask (and reach) almost all players by my suggested announcement/poll after their login? All in all, we're just thinking of how to develop the game ... Making Challenge Geocaches visible on maps and filterable in PQs would be 2.0! Guidelines for challenge caches really have helped solidify what they are, what's allowed, what's feasible - as opposed to reducing what can be done. Didn't the changes to the guidelines eliminate (aka reduce what can be done) the ability to have Challenges such as "Find 100 non-traditionals in a row" or "Keep your percentage of non-traditional above <some arbitrary number>"?